Traveling over long distances during the Georgian era was a rough ride. If you were someone with the ability to write, you would have needed a well made writing box that could withstand the poor road conditions. 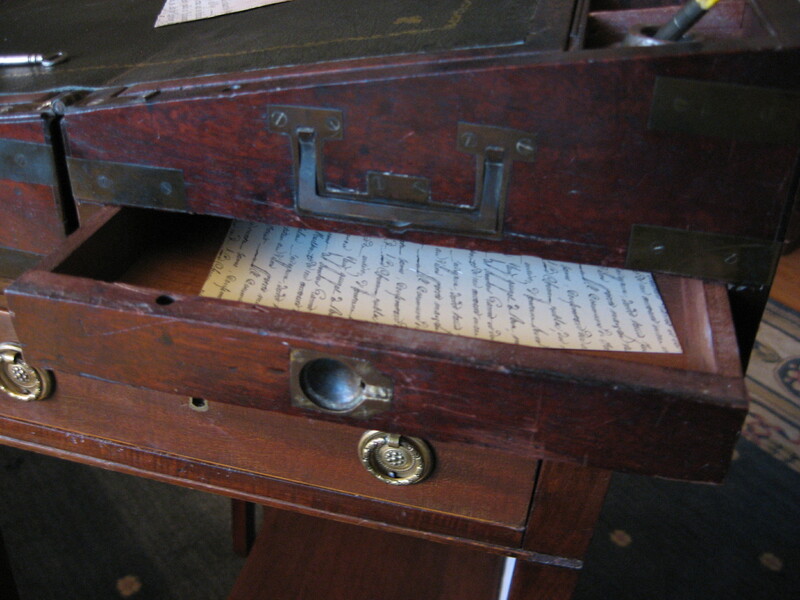 Members of the British military favored a specific type of writing box which was designed for durability. These portable writing boxes became known as military style or campaign boxes and were an important part of an officer’s campaign furniture. A soldier’s life revolved around his mail. 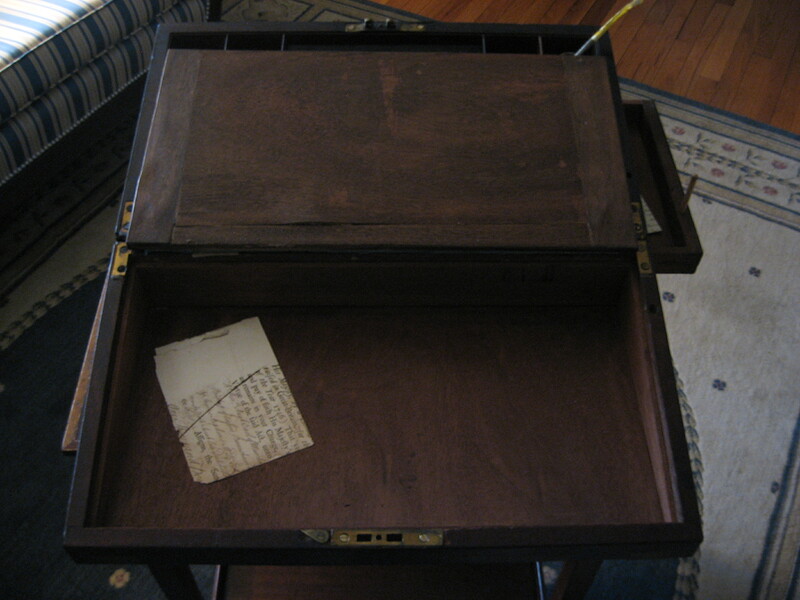 Officers would use their campaign boxes to draft military documents and to write letters home. I think a campaign box was one of the most personal items a man took with him when he left for battle. The photo above is of a campaign box that I own. Most of these boxes that were made between 1780 and 1810 were rectangular in shape and constructed of solid mahogany, with a flat top. They measure approximately eight to twenty inches wide, seven inches tall, and are ten inches deep when closed. The outside of these boxes are usually finished with wax. Most have thick brass corners with steel screws which strengthens the joints and prevents the corners of the box from being damaged. This was an important feature for anyone traveling over rough roads for extended amounts of time. The earliest boxes have drop down brass handles. In slightly later ones, like mine, the handles are set into the box. 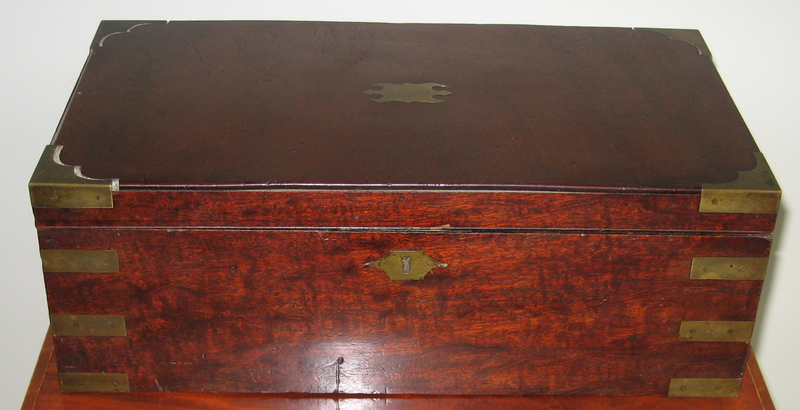 Campaign boxes of this period have one or two side drawers to store writing materials and correspondence. The really interesting ones have secret smaller drawers. And each has a lock to ensure your secret papers are not read by prying eyes. Opening a man’s campaign box would give you a very intimate glimpse into his private world. The top section would hold ink and sand wells, as well as a place to rest pens or a quill. 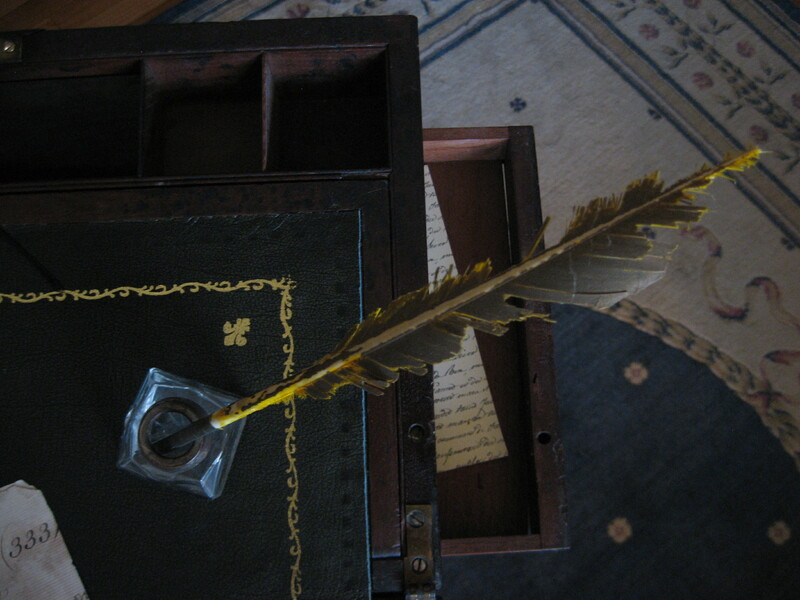 My quill-rest is removable and has a small compartment underneath. 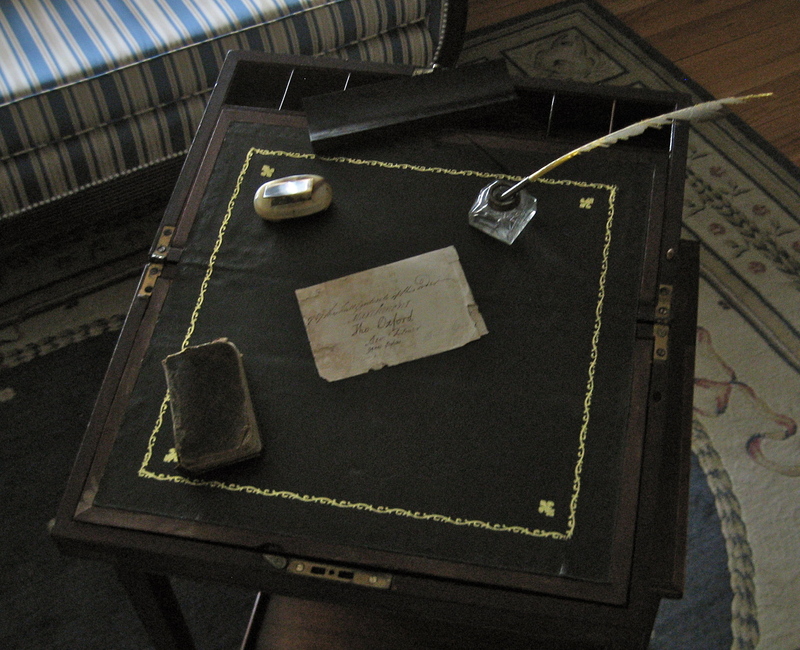 In early boxes, the writing surface would have been covered in baize, and later ones in leather or velvet. 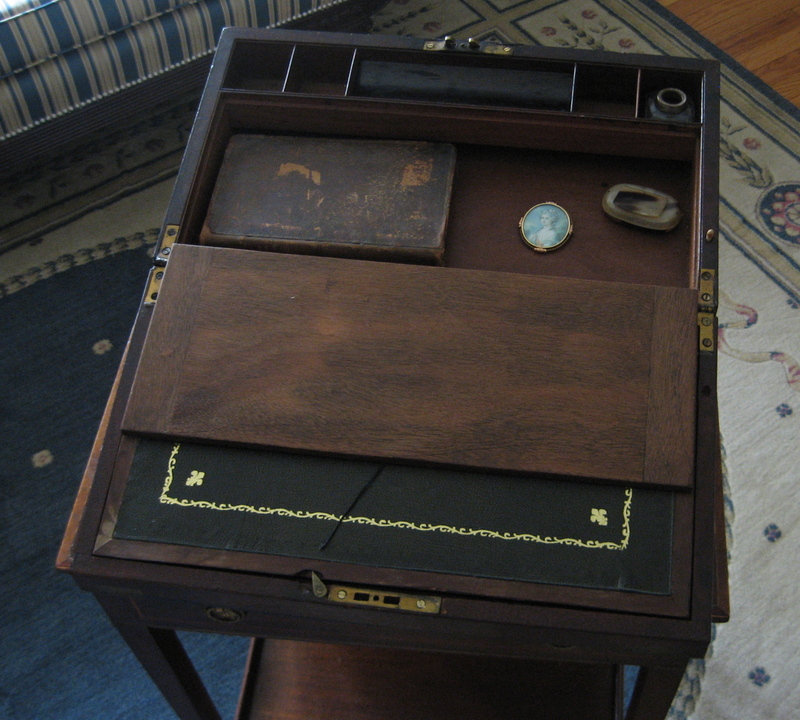 Each side of the writing slope is hinged and folds to reveal compartments underneath. This allowed the owner to store personal items such as books, additional paper, military orders, letters from home, eyeglasses, a snuff box and/or portrait miniatures of loved ones. Although we associate campaign boxes with use by the military, members of the public who regularly ventured out on long journeys would have used these as well. 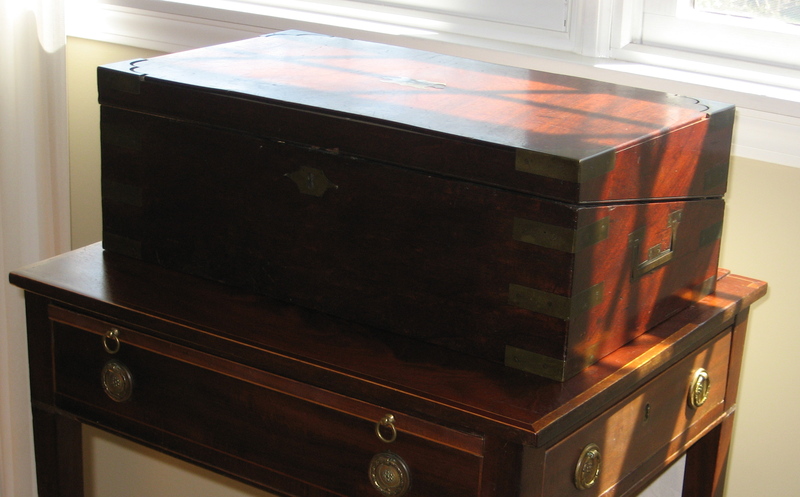 The photographs used in this post are of my English campaign box which was made between 1790 and 1810. It was reportedly own by a British Army officer. Each time I browse an antique shop, I’m always on the lookout for the ever-elusive box that has an undiscovered secret drawer. If I ever find one, I hope it isn’t empty. I just acquired one from c1800 which has inset handles, one of which broke through the side of the metal. Additionally, I’ve tried all methods I can think of to release the panel hiding the secret drawers under the pen tray and ink bottle sections, but with result. I have lifted the dividers around the pen tray, push down under it, but nothing. Any suggestions. If needed, I can send pics of the box. Really need some help/advice and I’m in California ,USA. Thanks in advance. Congratulations on your purchase! I hope it brings you many years of pleasure. I’m always interested in seeing other people’s antiques and would love to help. 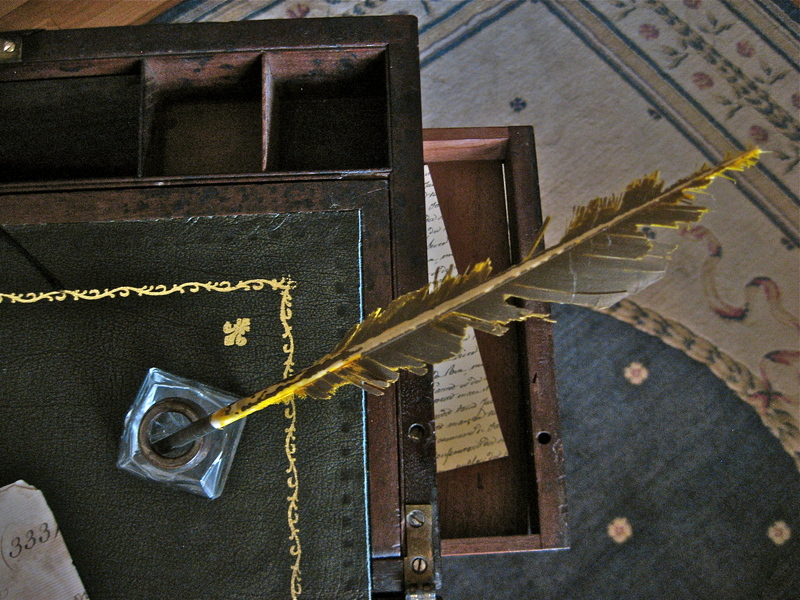 I’ll contact you via email to discuss your writing box further. A picture would definitely help to visualize the area in question. Thanks for contacting me. It’s always a pleasure to meet a fellow treasure hunter.